Super-fast. They came out same day, fixed it in about 10 minutes. Thanks, guys! Brian's fast, efficient, fair and honest. What more do you need in a service oriented business? I called Brian's heat and air today Brian and another gentleman showed up fixed my heater within an hour great guys would definitely recommend their service to everyone!! I would highly recommend Brian's Heat and Air. John was extremely helpful and knowledgeable, and he even helped me with getting rebate for my new equipment. Same day service! Called late on a Saturday evening, and they still came out to fix my problem. So grateful that I didn't have to suffer a night without working AC! Highly recommend. Thanks! They went beyond the call to make sure our heater worked properly. Recommended! Brian's Heat & Air did a great job. Friendly people. Came at night and had awesome service. I highly recommend this company. Mike and Brian came out and took my electric heater that was not working out and put a gas furnace in my dining room they did and great job I am now back to being cozy in my home I recommend them for your all of your heat & air services very knowledgeable guys!! Great experience, I've dealt with other companies in the past and these guys have been the best. They replaced my broken unit with a used one at a reasonable price. They were quick and knew what they were doing and most importantly they should up at the time they said. With all that said, I would recommend them. They guys from Brian's were great. Gave a good price and we're up front about it. I will be recommending them to any of my friends that need work on their air. They were not playing around. They came out fixed my issues and didn't try to sell me anything (which I appreciate). Let me know what else may be wrong with my unit but weren't pushy. Great experience. Brian is very knowledgeable, friendly and fair. I have used his services for both my heating and air conditioning needs over the past 5 years. He offers fast and accurate repairs and installation - as well as system checks as the seasons change. His prices are very reasonable! He is willing to work overtime when needed. I would recommend his services and will continue to use him in the future! 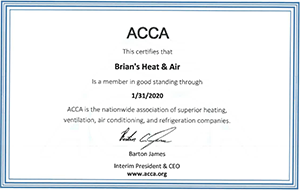 Recently I had an emergency on a Sunday evening regarding my heating unit, I call Brian's Heat and Air and requested service as soon as possible. Brian returned my call within in 20 minutes and was at my home within the hour. His service was professional, polite and the unit was fixed and working within an hour. After the job was completed he cleaned the area better than it was before he started. I was completely satisfied with his work and fees. I will recommend this company to all friends and family with complete confidence that the job will be done correctly and the price less than I thought it would be.